Strain Gauge Balance units that will measure the six different components forces in a wind tunnel that are installed into wind tunnel models are calibrated with the Calibration Rig assembly. The cabinet assembly is like a large six unit platform scale. One balance scale unit for each individual force. A Strain Gauge Balance unit is lowered vertically into the center of the Calibration Rig. A selection of calibrated weights are placed on each of the six round platforms creating a simulation of the six different wind force components into the Strain Gauge Balance unit being tested. Measured are the three forces for drag, lift, and side and the three of moments of pitch, roll and yaw. Boller and Chivens constructed the 9-ton instrument and installed it in one of the Moffett Field wind tunnel buildings. The assembled Calibration Rig was so large the front window Boller & Chivens building had to be removed in order to put it on a truck and trailer unit. 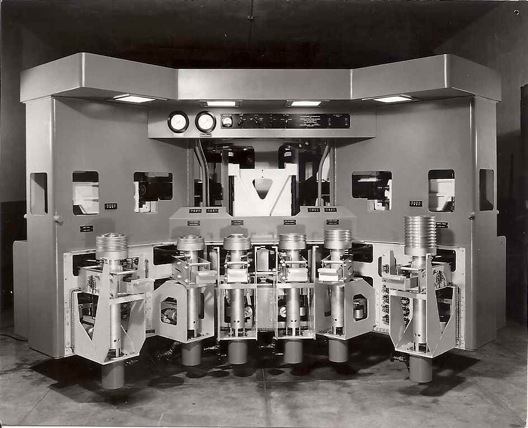 The assembled Calibration Rig was installed at NASA Ames Research Center Moffett Field, California. 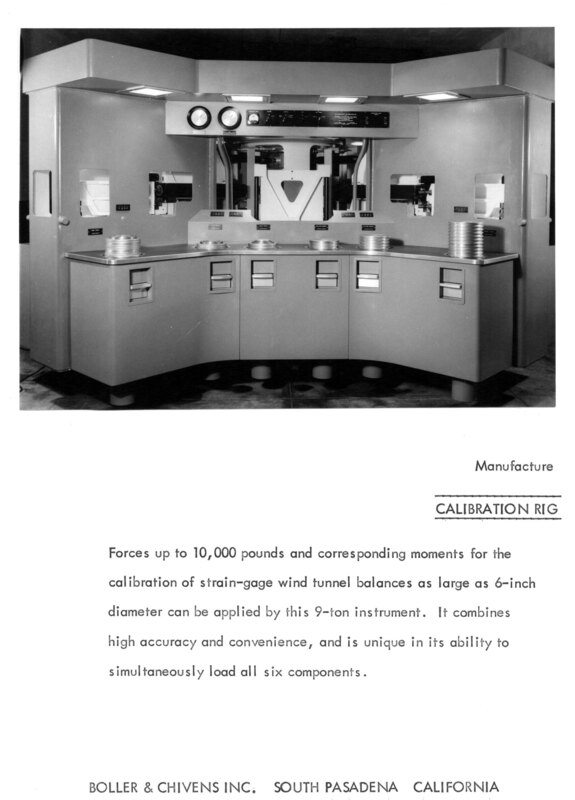 Don Winans of Boller and Chivens assembled the Calibration Instrument and he also supervised the installation and the initial testing of the Calibration Rig at Moffett Field in California. Calibration Instrument with front covers and counter top removed.